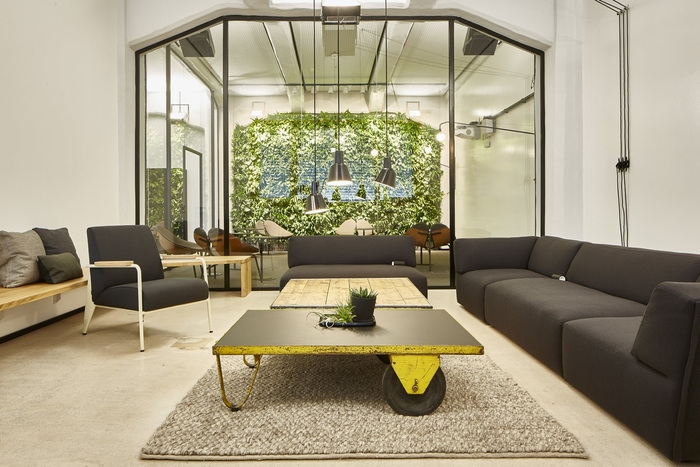 PLY has designed the new offices of creative digital consultancy Deloitte Digital, located in Düsseldorf, Germany. For Deloitte PLY atelier developed and implemented a future office concept during in Duesseldorf. The office is optimised for digital developers and creatives, project-based working with a client co-working and a secure area. Also, a stop-motion studio was developed as well as a living kitchen with open fire space, green walls with living plants and last but not least lots of casual meetings, presentation rooms, formal meetings and space for focused working. The old weapon factory offered a great atmosphere with ceilings over 4m high, big transoms invited for an open view through the whole office. A modern and functional workspace meets familiar atmosphere keeping live-quality as high as at home.